Now that's a water cannon! Our town may only house 60,000 souls or so, but that doesn’t mean its police force can’t have cool equipment, like armored water cannon trucks. We were out for our Sunday stroll when we noticed all access points to our town square were covered by police vehicles and uniformed officers. Poised at the brink of the square was what looked like a Canada-style recycling truck. On closer inspection, we found the police logo on the door, which led to questions about whether police were branching out into the refuse and recycling collection biz. Water cannons are abhorred in North America for their historical use in the race riots of the 1960s, but they are still made and sold in Europe (U.K.-manufactured), and come in handy to remind soccer rioters to keep their game-enthused vandalism confined to the arena. Dave voted we just keep walking and not let our eyes meet any of the officers’ gazes, but my reporter sensibilities drove me on to the nearest armed police officers. Dave kept a distance so that after my arrest he would still be available to file a report to Amnesty International and call our U.N. -connected friends to see if they could shake me loose from the clutches of the Swiss authorities. The officers were friendly and said that they were readying for a soccer riot, which is just about the best thing I’ve heard all year. European soccer riots are the stuff of legend and seeing one up close would be memorable. This view is why, by the way, Dave would like to put a leash and muzzle on me when we go out for a stroll. Sadly, he said there was no need to stay clear. None of the officers wore that tense ‘don’t mess with me I have guns, billy clubs, a stun gun and I am ready to play Star Trek/Star Wars/Battlestar Galatica on your head’ expression. 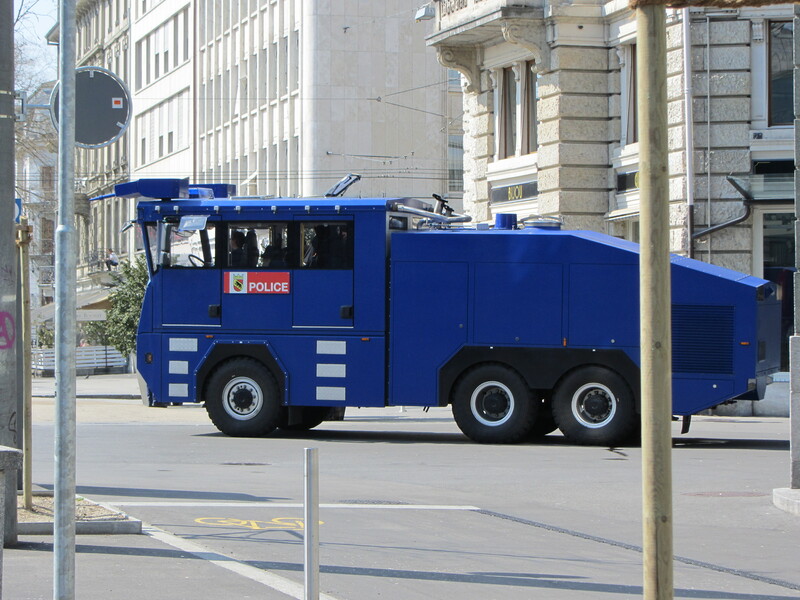 The armored water cannon vehicle, the haul-you-off-to-jail vans and police were all a show of hands and in our mostly unassuming quiet little watchmaking town, that is enough to keep the peace. Tear gas used to protect pro-life protesters. 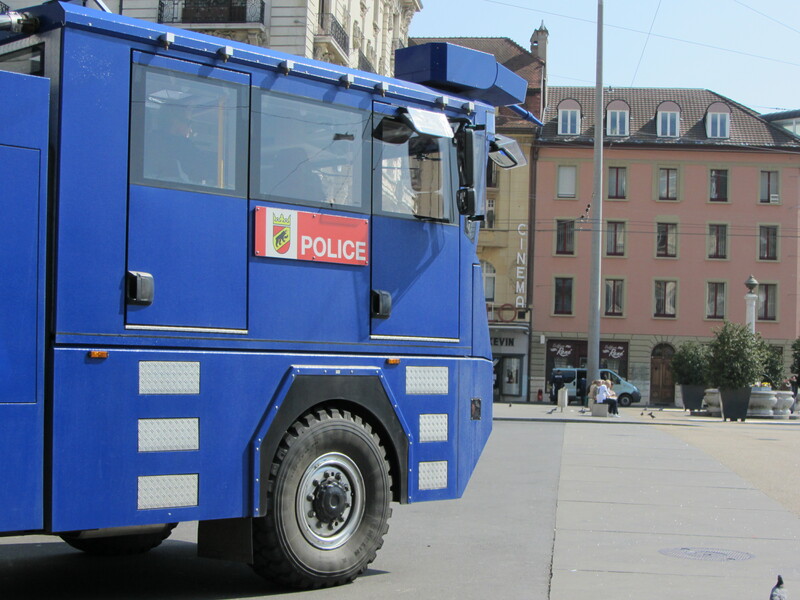 As a side note: Although the police told me there was water in the cannon truck, Swiss police do sometimes use the trucks to shoot tear gas into crowds. It is reported they did exactly that last year when a peaceful march of about 1,000 people favoring protection for unborn children was threatened by people favoring unrestricted abortion access. ← 98: French fils et filles – c’est bon or non?